A strategic, western sci-fi fantasy themed card game, Grimslingers features two different modes of play - versus and coop. In versus, players will go head to head in teams or a free-for-all using a wide selection of spells, items and abilities. 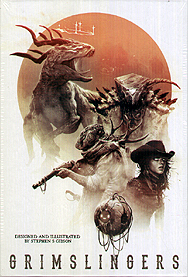 In co-op, players will work together through a narrative campaign composed of four 60-90 minute play sessions battling strange creatures, overcoming intense challenges, collecting loot, gaining levels and exploring the Forgotten West.